While thousands of undocumented students graduate from high school each year, only a fraction attend college, and even fewer graduate. To make matters worse, the fate of DREAMERs, or those who qualified for Deferred Action Against Childhood Arrivals, remains uncertain, feeding a culture of fear among undocumented students. 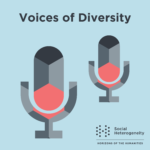 This podcast highlights the voices of undocumented students earning their PhDs within the University of California system. In this episode, we will hear from “Angie”, a counseling student at the University of California, and Michaelangelo, a political science student at the University of California, Riverside.